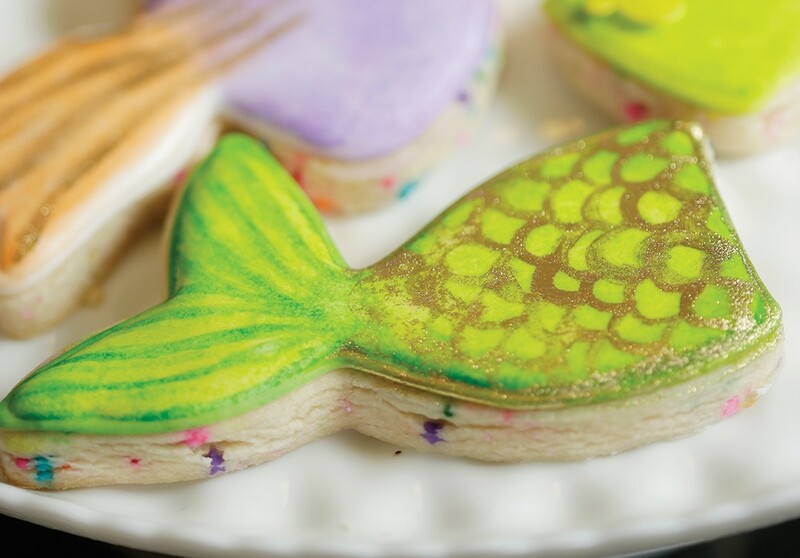 Each cookie is a unique work of art at Amber Fenton's Electric Sugar Cookie. A backdrop of white royal icing showcases Amber Fenton's signature neon "watercolors" made from food dye. Fenton is a cookie artist — a "cookier." Her vivid palette conjures up electric green cacti streaked with edible gold glitter, while half-moon shapes with scalloped inner edges become slices of hot pink watermelon with toothy bite marks. Chartreuse mermaid tails shimmer with golden scales, and five-pointed stars sport a patriotic ombré of red, white and blue. From mixing the dough to the last brush stroke, Fenton's process for each batch is time intensive. After putting cookie sheets into the oven, she mixes up some royal icing, typically made from egg whites (or meringue powder), powdered sugar and water. Royal icing is favored by pastry chefs and cookiers both because it dries in a smooth, hard coat that allows for other decorations to be placed on top. Fenton usually makes her royal icing without added color since she paints over it with diluted food dyes. Once the layer of royal icing has completely set, she mixes up her paint colors by diluting food coloring into high-proof alcohol. When applied, the alcohol evaporates, leaving the color behind. (She uses alcohol for this step because water can crack or melt the royal icing base.) Then, she paints. This rainbow spectrum Fenton brushes onto each cookie using her trademark soft watercolor technique almost seems too colorful to eat. "The draw is definitely the artistic side of it," she says, adding that since childhood, cookies have always been a favorite treat to bake. 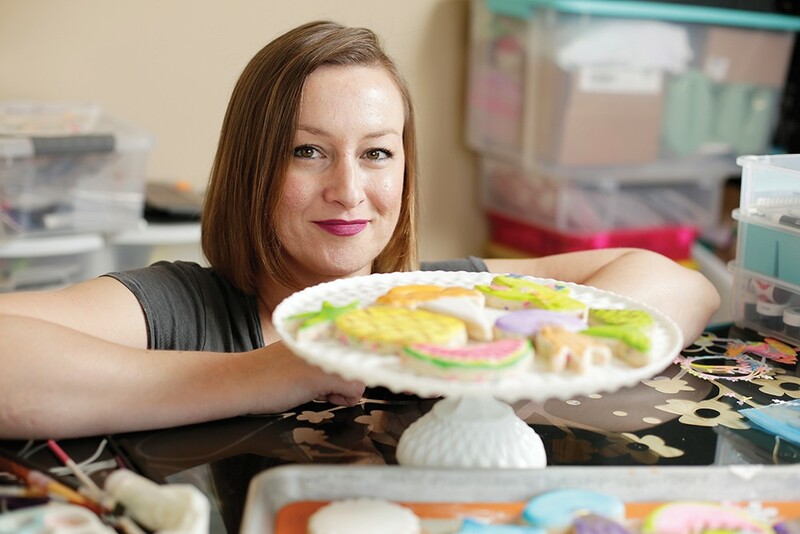 The self-taught baker began decorating sugar cookies more than five years ago as a hobby. Though she still considers herself a hobbyist baker, Fenton turned the creative outlet into her part-time business, Electric Sugar Cookie, last December when she first sold cookies at a local makers market in Coeur d'Alene. "I bought all of the packaging and really wanted to make it presentable, so once I got all that perfected and got a lot more confident — and I think that social media gives me a lot of confidence, too — I started posting and getting all these likes." Now, Fenton bakes and decorates custom cookie orders several times a week from her home kitchen in Coeur d'Alene (Idaho has a cottage food law, which allows for certain consumable products to be made and sold from a person's home), both for local and faraway customers. She continues to share samplings of her cookie art on Instagram at @electricsugarcookie. Most customers buy one or two dozen cookies at a time, which Fenton sells for $3 each, regardless of order size. She admits that she could probably raise her prices to better compensate herself, but is worried she'd price herself out of the regional market. "It's a labor of love," she says. "If I were to break it down, I'd be getting paid like a dollar an hour or something ridiculous. But it's pure enjoyment, and when it's not I scale back and don't search for more orders."